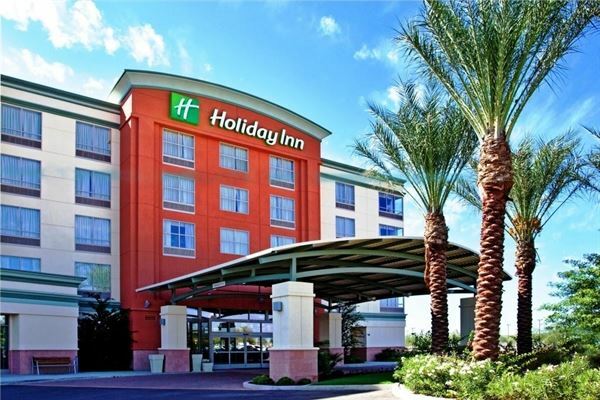 The Holiday Inn & Suites will add a 20% service charge and a 8.3% sales tax to all charges. - A guaranteed number of guests attending all functions contracted on a per person basis must be confirmed three business days prior to the start of the function. The Client will be charged for the greater of either the guaranteed number or the actual number of guests served. If the guarantee is not received when required, the Client will be charged for the expected number as indicated on the Banquet Event Order or the actual number served. - The Hotel will prepare food and set the function room for 5% over the guaranteed number. This is the maximum we will prepare. We, as the Hotel, are not obligated to bring in any more chairs or tables or prepare any more food other than what your guaranteed number of attendees is and 5% over the guaranteed amount of attendees. If the guarantee number increases without prior knowledge, the food preparation and room set counts will be limited to the guaranteed number. As the client, if there are more guests to arrive, payment will be taken care of by the conclusion of the event by cash, debit or credit card to take care of any extra accommodations. - NO FOOD OR BEVERAGE OF ANY KIND IS PERMITTED IN FUNCTION ROOMS UNLESS THE HOTEL PROVIDES IT. NO FOOD OR BEVERAGE PROVIDED BY THE HOTEL IS ALLOWED TO BE REMOVED FROM THE CONFERENCE CENTER. CAKE IS AN EXCEPTION. - If a cancellation is to occur within 10 days of the event date, full payment is due; if within 30 days prior to the event date 75% of estimated charges would be due. If a cancellation is 31 days or more prior to event date 50% of estimated charges are due. For Social events, there is no charge for the use of the Ballrooms, we also provide colored table linens, centerpieces, decorations for the appetizer and buffet tables, guest book tables, cake stations- We are licensed to provide all foods and beverages for events, other than a Celebration cake, you are allowed to bring in a cake. We provide all types of great foods and service, we provide alcoholic beverages or non-alcoholic if you decide, serving staff and bartending staff, we set up everything, decorate, serve your group, and then clean everything up afterwards, all you do is enjoy your time with your friends and family. We look forward to speaking with you on how we can make your event, the most " Special Event " you can imagine. We require the final guest count only three business days prior to your event date. We require a monetary deposit, which is deducted from your event total later on. 600 sq. ft. perfect for meeting space or small occasion. 400 sq. ft. ideal for smaller meetings or classes.